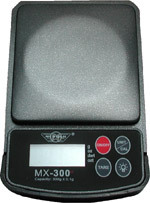 The My Weigh MX-500 Digital Scales are the best selling low cost precision pocket scales. These scales have a patented design sliding cover that doubles as an expansion tray and an extra durable load cell. The integrated expansion tray of the My Weigh MX-500s are perfect for weighing small birds, loose metals, bone fragments, gems, herbs or ingredients.